Bosch and Miele washer and dryer models are easily the best compact, apartment size laundry in the market. Both brands are known for their reliability, quality, and status as European powerhouses. 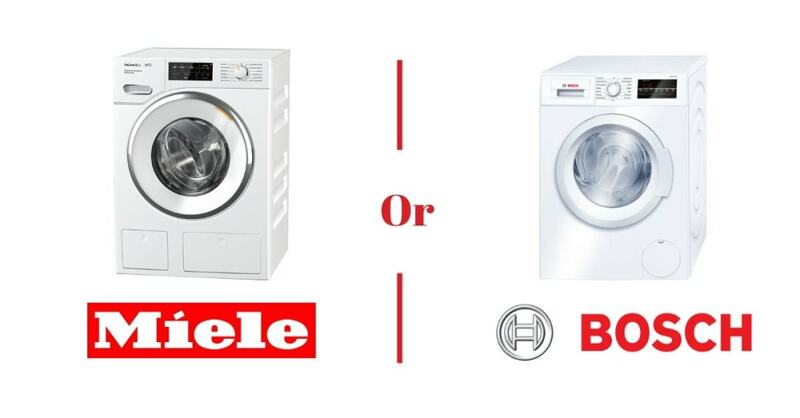 When it comes time to choose your next appliance for doing your washing and drying, which brand should you go with? We covered compact washers and dryers in our in depth buying guide with many tips and techniques. However, since Bosch and Miele are head and shoulder ahead of their competition, we wanted to compare them in depth on a separate article. Miele and Bosch are German companies that have established themselves as experts in the field. Both have long histories of success due to superior engineering for all types of appliances. Unsurprisingly, these qualities of reliability and durability also apply to the lines of compact washers and dryers from these manufacturers. Miele stands out right from the start with its heat pump dryers that save as much as 60 percent on your energy bill, as well as reducing wear and tear on clothing, in comparison to Bosch dryers. That being said, the comparison is not cut and dry, and both brands are consistently highly ranked for their washing machines’ cleaning performance. We will take a closer look at the laundry technologies behind both Bosch and Miele, showing you the unique features from each manufacturer, so you can make an informed purchase. Miele has a reputation for making the top compact washers you can find. Miele’s washers use precision engineering and undergo rigorous testing. The result is that while most companies offer up to a 10-year lifetime for their machines, Miele offers an impressive 20 years. Miele even has a proprietary detergent system. The company’s TwinDos system stores as much as three months of detergent, as well as non-chlorinated bleach, then releases it in small quantities every time you wash clothing. This takes one of the steps out of doing laundry and removes the guesswork about how much detergent to use. Miele also offers CapDosing capsules that have six unique formulas, each for a specific type of laundry. There are capsules for Proofing Agent, SilkCare, WoolCare, Outdoor, Down, and Sport, in addition to three fabric softeners: Aqua, Cocoon, and Nature. There is even a Booster to get rid of those stubborn stains. Those who prefer not to use this tech can also use their favorite detergent instead. The latest Miele W1 washers come with a unique 1600 rpm motor. Thanks to its incredibly high spin rate, moisture is removed more efficiently, dramatically cutting down the drying time. The Miele W1 washers also come with a whopping 18 preset washing cycles, along with other options for customization. The result is a one-of-a-kind washing machine. For more details, take a look at our Miele W1 analysis video. The Miele T1 dryer line follows the same trend of success as the W1 washers. The standout feature of these dryers is the previously mentioned Heat Pump Technology. A Miele Heat Pump Ventless Electric Dryer improves efficiency over that of a regular Ventless Condensation Electric Dryer by an impressive 50 percent or so. Even better, Heat Pump dryers will not release moisture into the laundry room since they are closed-loop systems. The use of less heat saves energy while protecting your clothes and allows for quicker drying. In addition, T1 dryers from Miele make use of steam power for gentler drying. There are also multiple drying cycles and an auto sense feature to prevent over-drying. Those in search of compact ventless dryers will love T1 dryers. 300 series offers entry-level appliances. Within its washer line, Bosch offers the WAT28400UC. This is a stackable washing machine with a ventless condensation dryer that works with it, WTG86400UC. Keep in mind that as we explained, a condensation dryer is different from a Heat Pump dryer. These require good circulation of air and are less efficient. Even so, Bosch does maximize the efficiency of this dryer thanks to a range of features in the 300 Series. These include 15 washer cycles, a water adjustment system, Active Water, an antivibration system, and quiet operation. The dryer does not have a steam cycle, reversible door, or sensor dry, as it is entry-level. 500 series is the mid-level appliance line from Bosch. The 500 Series adds on some enhanced features to both the washers and dryers. Building on the 300 Series model, the 500 Series Bosch washer, the WAT28401UC operates much more quietly. It also has a leak protection system, silver design accents, and a useful sanitize cycle to kill bacteria. Other than these features, expect the same level of washing performance. The 500 Series Bosch dryer, WTG86401UC, adds a reversible door and makes operation quieter while keeping the overall performance the same. 800 series is the flagship line of appliances from Bosch. The 800 Series washer from Bosch, WAT28402UC, features a quick wash cycle to clean smaller loads in only 15 minutes and adds chrome accents. The premium design of the washer is matched by the 800 Series dryer, WTG86402UC, with its equally elegant design. This dryer has 15 different cycles, including the time-saving super-quick dry. Those who want smart solutions in their washer and dryer will also find it in the Bosch 800 Series. The WAW285H2UC uses Bosch Home Connect as well as Eco Washing to lower energy bills. The comparable dryer is the WTG865H2UC. When washers first hit the market, there were not too many options or features; people were just glad they no longer needed to wash items by hand. The time of large yet simple washing machines is long gone. Today’s machines have numerous washing cycles and other features. Nearly every type of stain has a unique cycle, and most washing machines also have auto-sensing technologies that can automatically select the right program for your load of laundry based on the soil levels it senses. For more in-depth information, please check our reviews for Bosch and Miele washers and dryers. Everyone knows that while washers and dryers are convenient, they use a great deal of water and electricity. Luckily, laundry technology has evolved over the years, and energy efficiency is now a key part of both washers and dryers. All major brands now have solutions to reduce electricity and water consumption. The government has also taken actions, including placing regulations on energy usage for various appliances. If you spot the Energy Star label on your washer or dryer, you know that the appliance meets government regulations. All front-load washers from both Bosch and Miele bear this label. To help with efficiency, Miele washing machines feature Automatic Water Level Adjustment, filling up the machine based on the load size to minimize water waste and your bill. The dryers from Miele save energy with the Auto Sense feature, detecting moisture so they can adjust the drying time. This prevents over-drying. As previously mentioned, the Heat Pump technology in Miele dryers also improves energy efficiency by up to 60 percent. Bosch has its own automatic water level adjustment system, known as ActiveWater. This works just like the same feature in Miele products. Bosch also uses an internal heater to efficiently heat the water. In terms of Bosch dryers, you will also find sensor technology that can tell when laundry dries. One of the biggest issues with using a washing machine is the vibration and noise. Washers are usually capable of spinning over 1,200 rounds each minute, which causes vibration and noise. As with efficiency, manufacturers have improved noise and vibration over the years thanks to technological advances. In the case of Bosch, you will notice Antivibration Circular Side Walls that help reduce the vibration. Higher models of Bosch also have an EcoSilence Motor for smooth, nearly silent operation. At the moment, both Miele and Bosch produce only compact washers and dryers. While full-size washers measure 27 inches wide, compact ones are 24 inches wide. You can also find even larger washers from other brands, either 29 or 30 inches wide. The latest Miele W1 washers all share capacities and dimensions. They each measure 24 inches wide with a capacity of 2.3 cubic feet. This is right in the middle of other compact washer capacities, as they range from 2 to 2.5 cubic feet in capacity. The Miele T1 ventless dryers with heat pumps also follow industry-standard measurements, with a width of 24 inches and a capacity of 4.1 cubic feet. The style of Miele washers and dryers is a basic white, with a digital indicator on the front top. The result is a modern, clean appearance. The Bosch compact washers and dryers share the width of 24 inches with Miele machines, but their capacity is slightly smaller. The washers hold 2.2 cubic feet, while the dryers have a capacity of 4 cubic feet. Like Miele, Bosch has a clean, white design for a classic appearance. Overall, Bosch and Miele have similar dimensions - 23 1/2" width, 33 1/4" - 33 1/2" height, 25" - 25 3/8" depth except for Bosch 300 Series WAT28400UC Washer. Bosch's WAT28400UC has shallower depth of 24 1/4" that can be useful when you have limited space for your washer. Both Miele and Bosch washers have their own unique interior drum designs. For Miele, this is a honeycomb drum with a hexagon-shaped surface that lets fabrics glide along on a thin layer of water. Bosch offers a Snag Free Structured Stainless-Steel Drum with the same goal: cleaning laundry without damage. The Miele T1 dryers also stand out with a reversible door option, meaning you can open it to the left or right. However, it is important to note that M1 washers from Miele just have left hinges. The reversible door is not an option due to the auto-lock electronic system. Bosch follows suit, having a reversible door on the dryer but not the washer, except for the 300 Series WTG86400UC dryer. One key difference between the designs of the Miele and Bosch washers and dryers is the electricity. Most compact dryers on the market use 220-volt electricity, but Miele opts for 110 volts. This eliminates the need to add another 220-volt outlet to your home, which could be challenging. Miele also has a NEMA adapter for those who previously used a 220-volt electric dryer and are switching to a 110-volt Miele one. The adapter plugs into a four-prong 220-volt outlet, converting it into two 110-volt ones. Bosch does use the standard 220-volt electric outlets for washers and dryers. However, you plug the dryer into the outlet and then plug the washer into the dryer. This means you only need a single 220-volt outlet to run both the washer and dryer, not one for each, which many homes do not have. It is increasingly popular to opt for home appliances with smart solutions. Most current smart solutions are still relatively basic applications of the technology, but they are still upgrades. These smart features will likely increase in the future. Miele offers WiFiConn@ct, an application for mobile devices that shows you status updates for your drying or washing cycles. The application will also let you know when the detergent gets low, so you have time to order online. Bosch’s smart option is Home Connect, which lets you use an application to monitor the cycle and control the machine. The brand also has an Easy Start Assistant, suggesting a washing cycle for your load and offering options for stain removal. Miele WWF060WCS is the entry-level washer for Miele. Although entry-level, it is actually good enough to beat top machines from competing brands. That is why the price tag is higher than expected for a base model. The WWF060WCS features 18 different wash cycles, covering all types of laundry. You can also use Soft Steam, which involves applying steam following the wash cycle to reduce wrinkling. The tumble speed is an impressive 1,600 rpm, reducing the moisture level of your laundry. Additionally, the Automatic Load Recognition system ensures the washer uses just enough water for the laundry, saving energy as well as water. This machine also features Miele’s special HoneyComb Drum design to gently wash fabrics without damage. Finally, this model offers Wi-Fi features, including the ability to check the load from your smartphone. Miele also takes the lead for compact dryers. The New Miele T1 line uses the Heat Pump technology for excellent efficiency. This system requires less heat for drying clothes, which translates to energy savings. The T1 dryer also has a Perfect Dry system that measures the mineral and moisture content, then selects the appropriate drying cycle. This machine also works with the Miele special FragranceDos laundry scent for fresh-smelling clothing. Like the W1 washer line, the T1 dryer has Wi-Fi connections and the HoneyComb design. There are 12 drying cycles, including Steam Finish to remove wrinkles. The other T1 dryer from Miele is the TWF160WP T1 Series 24" Stackable Ventless Dryer. The main differences are that this dryer does not feature the steam option and the front door is not made from glass. It is otherwise identical to the previous dryer. Although Bosch makes its entry-level washer simpler than its higher-end models, the WAT28400UC produces excellent results. As previously mentioned, the 300 Series is Bosch’s entry-level model. This washer has 15 wash cycles, including the quick cycle that takes just 30 minutes. Although there is no steam cycle, the washer does efficiently remove stains. The machine is nice and quiet, thanks to antivibration walls and the EcoSilence motor. The ActiveWater system uses the appropriate amount of water to save energy and water. The washer is also stackable and plugs into the dryer, working with 220-volt outlets. The drum has Wave profiles for gentle cleaning. The complementary dryer is the WTG86400UC, the entry-level 300 Series model from Bosch. The dryer holds 4 cubic feet of laundry. Since it is ventless, there is no need for a hole or vent in the wall. As a condensation dryer, it is less efficient than a Heat Pump dryer. Even so, there are 15 dryer programs plus eight options, such as Quick Dry. This compact ventless electric dryer uses 220-volt electricity. Since this is an entry-level model, the dryer does not have a reversible door or steam cycle. It is stable thanks to antivibration side panels, making it ideal for stacking. The next washer in Miele’s W1 line is the Miele WWH660WCS with an incredible 21 washing programs for all types of laundry. It uses the familiar 1,600 rpm motor to remove a large amount of moisture. You also get the TwinDos detergent system that stores up to three months of detergent in the machine, letting the washer automatically use it. The washer also has Wi-Fi Connect, the steam option, and automatic load recognition. There is even an EcoFeedback Display that displays estimates for water and energy consumption. The 500 line from Bosch adds more features, with the WAT28401UC acting as the mid-level washer. There are nine options plus 15 wash cycles, a combination that covers all soil types. You also get features like ActiveClean water adjustment, the EcoSilence motor, the wave-shaped drum for gentle cleaning, and antivibration walls. This washer also features Aquasecure leak protection to stop water floods. The operation is also a bit quieter than the 300 Series and can fit an extra kilogram of laundry. The washing performance stays the same. The accompanying washer is the WTG86401UC, also with a 4-cubic-foot capacity. The drying system is the same as with the 300 Series, but the 500 Series has a stainless-steel drum instead of the Galvalume drum on the 300 Series. This enhances durability and quality. There are also more drying options and the same great performance. The top-of-the-line compact washer from Miele and the best of the W1 options is the WWH860WCS! This washer builds on the amazing features of other Miele washers while keeping the same 2.2-cubic-foot capacity. You get to enjoy an additional wash cycle, QuickIntenseWash. As the name implies, it is quick and efficient, cleaning a full load in under an hour. This washer also features a SingleWash option for loads under 1 kilogram. It improves energy efficiency by adjusting the energy consumption, water levels, and program duration for these small loads. Otherwise, expect the same features from other Miele W1 washers. Bosch’s flagship models are in the 800 Series, including the WAT28402UC and one other washer. This washer has a premium build with chrome accents on the control system and door lining. You get all the features of the 500 Series with a quieter and smoother operation. It also features a light inside the tub and AquaStop Plus leak protection to prevent water leakage. This machine has a solid performance and an appealing design, with a strong reputation for reliability. Or you can opt for the upgraded version of this washer, the WAW285H2UC, with extra washing cycles and Home Connect for Wi-Fi. The 800 Series dryer is similarly impressive. The WTG86402UC builds on the 500 Series, adding the chrome accents and interior light. This dryer also adds a quick cycle. For those who can afford it, this is the Bosch dryer to go with thanks to its high performance. As with the dryers, Bosch also offers an upgraded version with some extra cycles and Home Connect, the WTG865H2UC. In conclusion, these European brands known for their compact washing machines are both excellent options. Bosch has proven its overall reliability and quality. If your budget is a bit larger, however, the Miele products are exceptional with some of the best features you will find anywhere. Read our in-depth review article on Miele W1 Washer and T1 Dryer models. Check out our in-depth coverage of Bosch 300, 500 and 800 series washer and dryers.